Roses have long been used in love mixtures owing to the flowers associations with the emotions. A chaplet of roses worn when performing love spells (remove the thorns), or a single rose in a vase on the altar, are powerful love-magic aids. Women used to take three green rose leaves and name each for one of her lovers. The one that stayed green the longest answered the question of 'which one'? Roses planted in the garden are said to attract fairies. 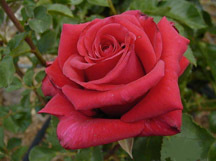 We have tried many different rose fragrances and this one outshines them all. Very very rosy, but not heavy. This oil will keep your room smelling like an English Rose Garden. You won't be disappointed.